The biggest snowstorm of the season hit the Midwest hard today, bringing 9 inches of snow that prompted numerous school closings and multiple car crashes, including a fatal pileup in Michigan. And today's storm is not the end of the bad weather on the horizon, as yet another storm is forecast to hit the Midwest, parts of the South and the Northeast this weekend. Because of all the snow -- and flooding forecast -- storm alerts are issued for 20 states from Wyoming down to Georgia and into New York. 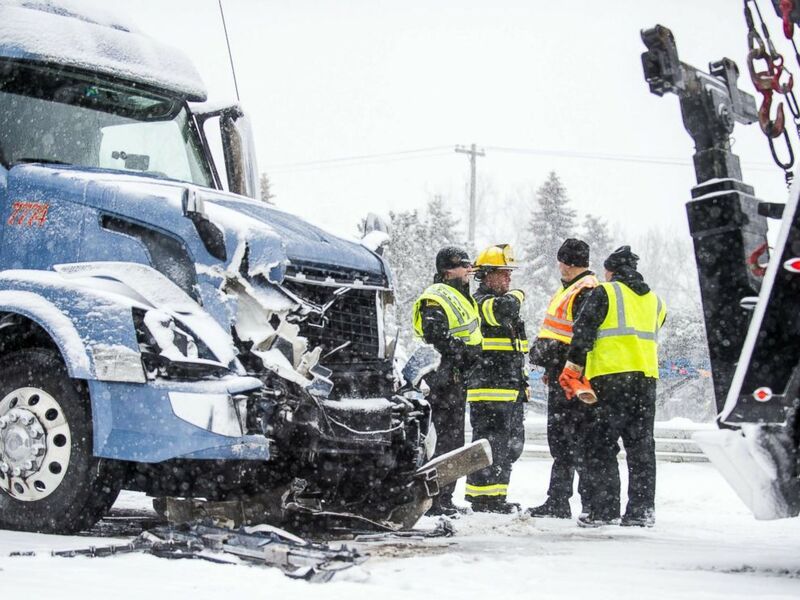 Emergency personnel work at the scene of a multiple vehicle crash along U.S. route 23 northbound, Feb. 9, 2018, in Fenton, Mich. Heavy snow continues to pound the Midwest from Chicago to Detroit, and is expected to move into western New York by the evening. The snow was wreaking havoc on the roadways in Michigan, where at least 30 weather-related vehicle crashes were reported, the Michigan State Police told ABC News. 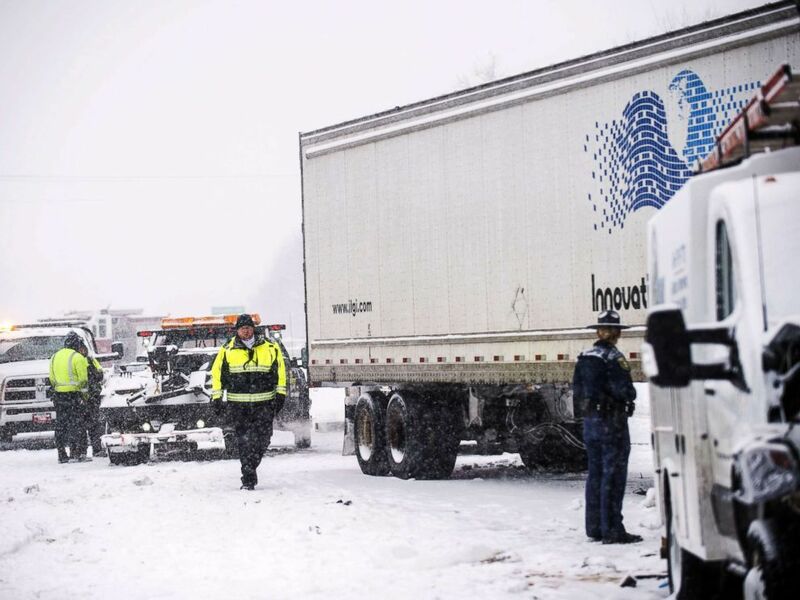 A multiple-vehicle pileup occurred around 11:20 a.m. on U.S. Route 23 in Fenton Township, Michigan, about 16 miles south of Flint. At least one person was killed and several seriously injured in the chain-reaction crash that involved two big rigs, police said. 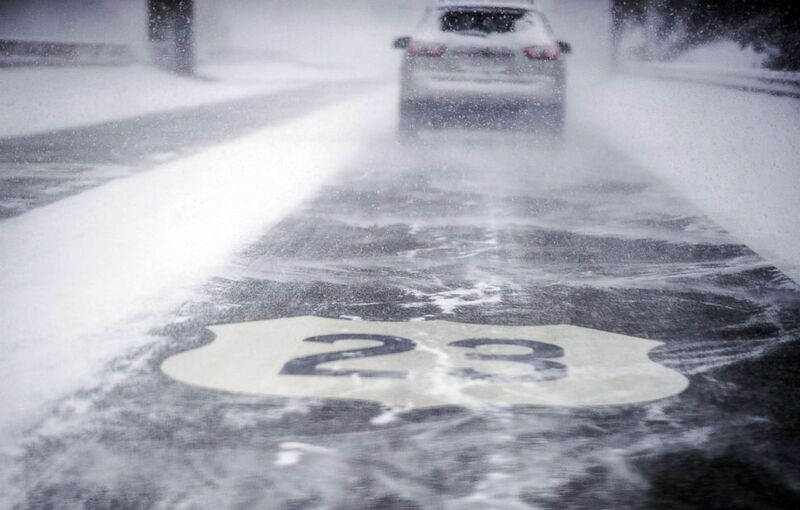 Snow drifts across U.S. route 23, Feb. 9, 2018, in Fenton, Mich.
A 38-vehicle pileup occurred about 12:30 p.m. on Interstate 94 in Galesburg, Michigan, east of Kalamazoo. State police said the crash involved 16 semi trucks and 22 passenger cars. It was not immediately clear how many people were injured. Snow was falling at an inch an hour Friday afternoon in Chicago, where classes were canceled at all public schools. Chicago Mayor Rahm Emmanuel said at a news conference today that the city had dispatched more then 300 salt spreaders and snow plows to tackle the storm. He said at least 700 flights were canceled at O'Hare International Airport and another 250 flights were scrubbed at Midway International Airport. The storm system is expected to move through southern Great Lakes Friday bringing snow from Iowa to Ohio. Snowfall rates are 1 to 2 inches per hour from Chicago to Detroit. 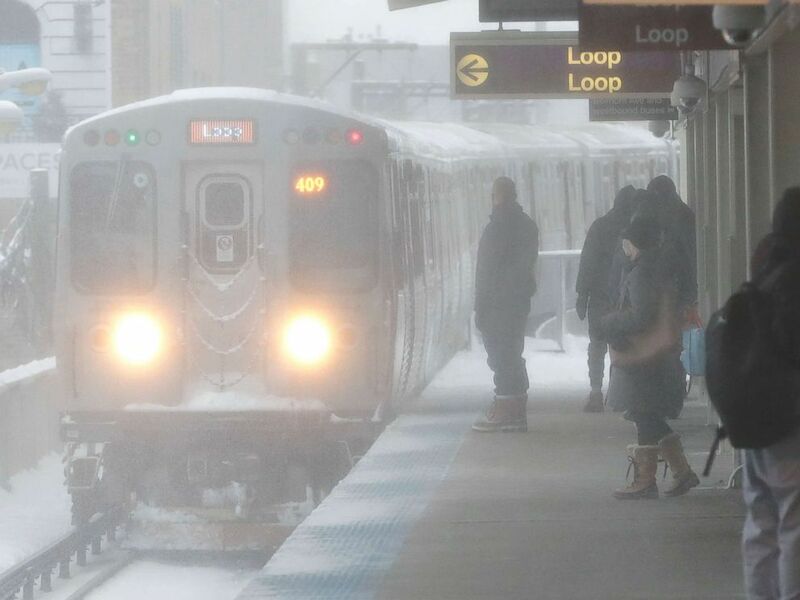 Snow is blown onto commuters while an arriving Chicago Transit Authority train arrives as a winter storm makes its way through several Midwest states, Feb. 9, 2018, in Chicago. Snow will be done in Chicago by Friday's evening commute and mostly over in Detroit. Snow will continue to fall from Buffalo, New York, to Albany, New York, and parts of western New England. 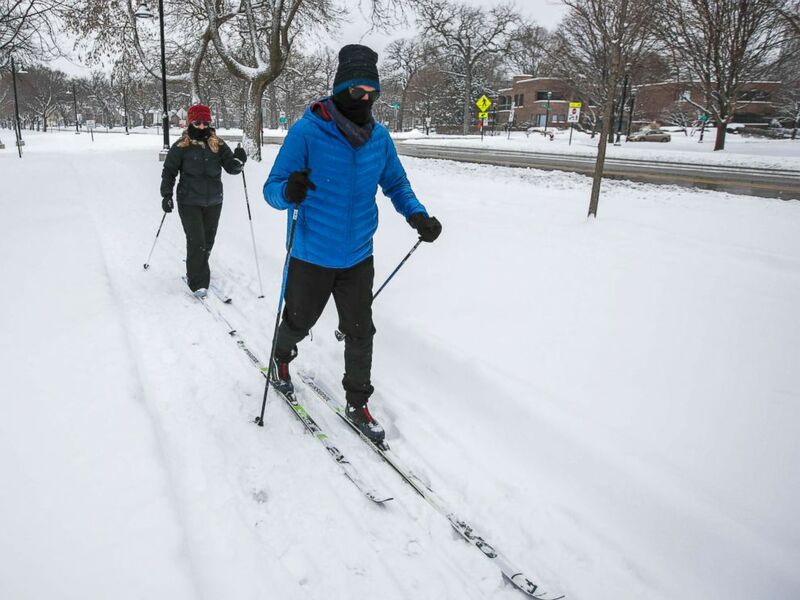 A couple glide along through a park on cross country skis as snow from a winter storm continues to fall in Evanston, Ill., Feb. 9, 2018. By Saturday morning, the storm system will begin to weaken but will bring light rain and snow to parts of the Northeast and New England from Buffalo to Burlington, Vermont, and into Maine. 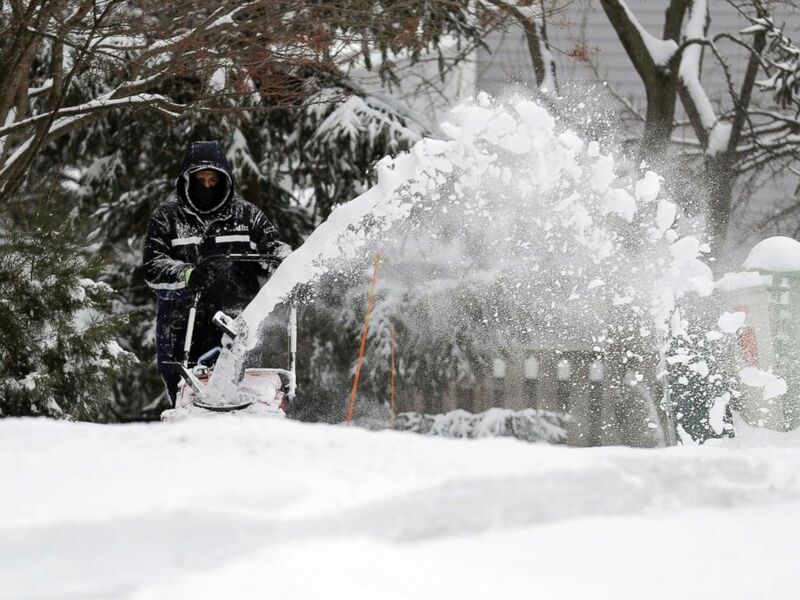 A man clears snow from sidewalk, Feb. 9, 2018, in Wheeling, Ill., as a winter storm makes its way through several Midwest states. Just as one storm system moves out, a new storm system moves right behind it for Saturday night into Sunday morning. This second system will be much larger, stretching from the Midwest into the South and Northeast. More snow is expected for cities like Chicago and Detroit with heavy rain expected from Nashville to Charleston, West Virginia, that could cause some flooding. Heavy rain is also forecast for Washington, D.C., Philadelphia, New York City and Boston. 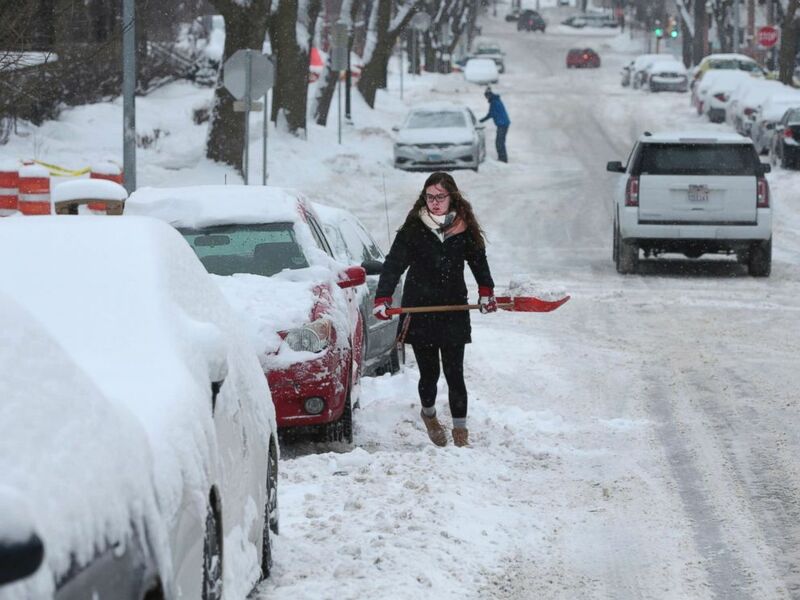 Morgan Leissring shovels out her car, Feb. 9, 2018 in Madison, Wis. The total snowfall forecast through the weekend from both storms will be the heaviest from Iowa into northern Illinois and from southern Michigan into western New York, where some areas could see 6 to 12 inches of snow. Rainfall totals will be up to 4 inches for the South and 2 to 3 inches for the Northeast along the I-95 corridor.